Glamsense is anotherprogram where you can sign up (for free) and review makeup and skincare products. They are similar to ChickAdvisor and Influenster. Glamsense is run by the same people as Topbox is, and they seem to have campaigns quite frequently, which is awesome. You're not always picked for campaigns, but when you do get one, it's a nice surprise. They are always full size products, and you get a decent amount of time to try the products out. 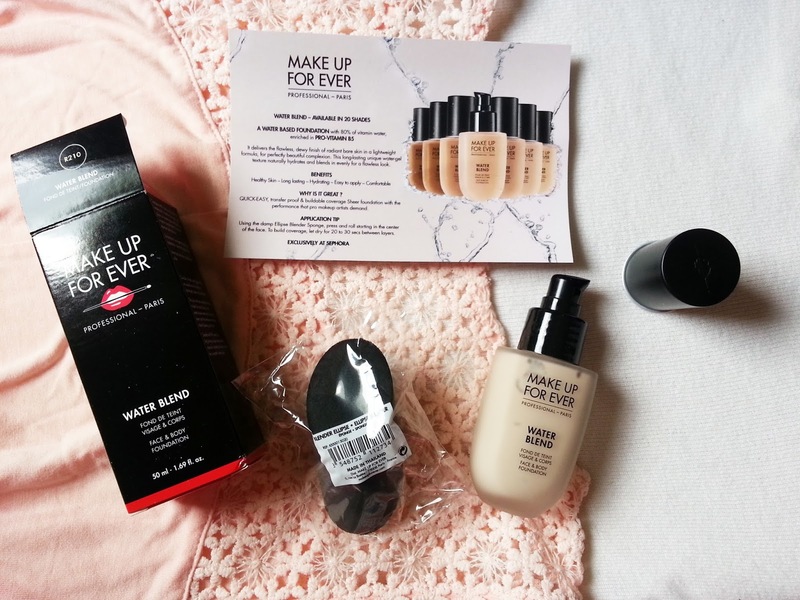 This time, people were chosen to try out the new Make Up For Ever Water Blend Face and Body Foundation. I luckily was picked, and all we had to do was provide a small review on Instagram, showing our initial application of the foundation, and then an after photo when we had worn it all day. I decided to give it a few trys, and to put a full review on my blog as well, because I have some thoughts on this foundation! We were given the choice to choose our shade, so I picked R210 - Pink Alabaster. This is the lightest shade, and I believe I fall more on the cool side of skin tones, the next shade up is Y215 - Yellow Alabaster, and I don't think it would have blended as well. 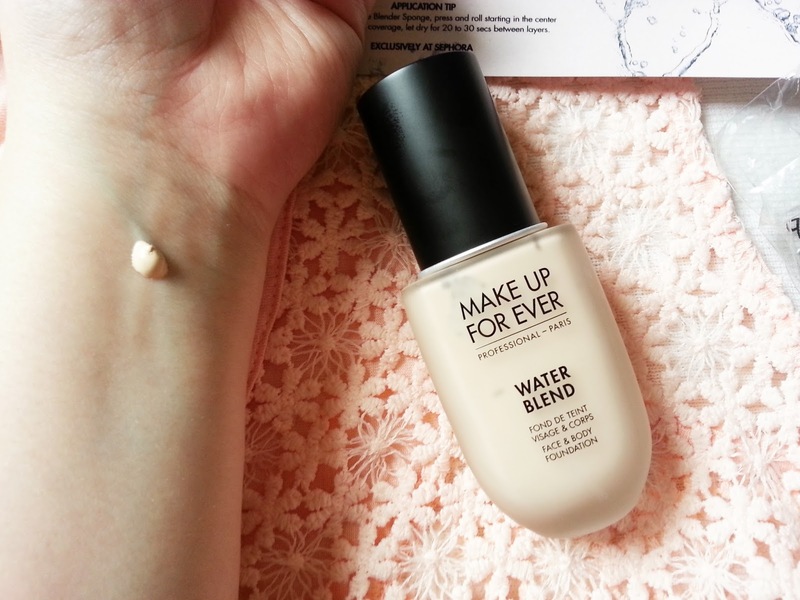 Make Up For Ever Water Blend Foundation is a lightweight, water-gel, face and body foundation that provides sheer to buildable coverage with a natural-looking, dewy glow and flawless finish. The iconic Face & Body foundation is back and better than ever. Formulated with 80 percent water and enriched with pro-vitamin B5, Water Blend Face & Body Foundation hydrates and improves your skin’s elasticity. The super lightweight formula allows you to customize your foundation result from sheer to buildable, providing your desired coverage level with a fresh, dewy glow. The long lasting, unique water-gel texture applies quickly and easily then sets to ensure that it will not transfer throughout the day. Ideal for all skin types, this foundation is available in an array of 20 shades to match all skin tones. When I quickly sheered it out on my arm, I was afraid it wasn't going to match my skin. It looked very yellow for something that is supposed to be pink alabaster. 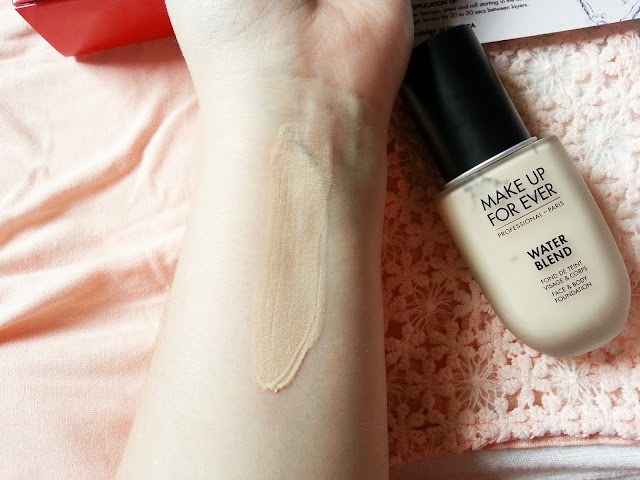 I blended it out a little more and it kind of melted into my skin - which is great! When I first received this foundation, I saw others in the makeup swap group I'm in saying that they really didn't like this formula. In the first picture you can see that Make Up For Ever also included their Ellipse Blender Sponge, however I didn't use that to apply the foundation because it had really bad reviews. People in that group were saying it just moved the foundation around on your face, that it soaked up product, and that it just wasn't good to apply the foundation. So I took their advice and applied the foundation the way I regularly would. The first time I tried this, I decided to try it with the Crown Pro Contour Brush that we received in the Boxycharm box. I've been having success with it when applying the L'Oreal Pro Glow foundation, so I thought I would get a good application with the MUFE foundation as well. I have to say, it did not blend well on my nose, or above my lips. It broke up a lot in those areas, made them look dry, and I couldn't build up the coverage. Any time I tried to go back over my face (in any area) it would push the previous application around, making my foundation look patchy and uneven. I knew it would have light coverage but the first application just didn't seem like enough coverage to me. So my first impression wasn't the best, but I was willing to try it again with different application techniques. This application was much better than the first. I ended up using a damp Real Techniques Miracle Complexion Sponge, and I liked it much much better than using the Crown Pro Contour Brush. It still looked a little patchy on my nose, but it definitely was not as bad or noticeable as using the brush. I still found that I couldn't layer the foundation without it picking up what was previously applied. I really enjoyed using the Real Techniques sponge, I can't believe it took me so long to finally try it! Between the two applications, I preferred this method. But I still had to give it one more try - applying it only with my fingers. Also on my face: Smashbox Photo Finish Primer Water, MAC Cosmetics Studio Fix Powder Plus Foundation in NW15, RealHer Eyeshadow Palette 1 (Be Your Own Kind Of Beauty), Kat Von D Tattoo Liner in Trooper, Eyeko Black Magic Mascara, Nars Radiant Creamy Concealer in Chantilly, Essence Cosmetics Make Me Brow Eyebrow Gel in Browny Brows, Tarte Blush in Tipsy, TheFaceShop Creamy Lipliner in Beige Garden, Bare Minerals Marvelous Moxie Lipstick in Get Ready. Now I also saw a ton of people leaving reviews online saying to use your fingers was the best method of applying this water based foundation. Because I wasn't happy with the other two applications (Crown Pro Contour Brush, and Real Techniques Miracle Complexion Sponge) I figured I would give this foundation one last shot before finalizing my review. I found that the foundation applied smoother on my face. However I had a harder time blending it in. I guess I've become too dependent on other tools - ha! Anyway, It looked a little more natural and it didn't seem to break up as much as it did when using the brush or sponge. Also on my face: Smashbox Photo Finish Primer Water, Tarte Shape Tape Concealer in Fair, RealHer Eyeshadow Palette 1 (Be Your Own Kind Of Beauty), Kat Von D Ink Liner in Trooper, Eyeko Black Magic Mascara, Essence Cosmetics Make Me Brow Eyebrow Gel in Browny Brows, OFRA Cosmetics Long Lasting Liquid Lipstick in Santa Ana, Milani Blush in Dolce Pink. 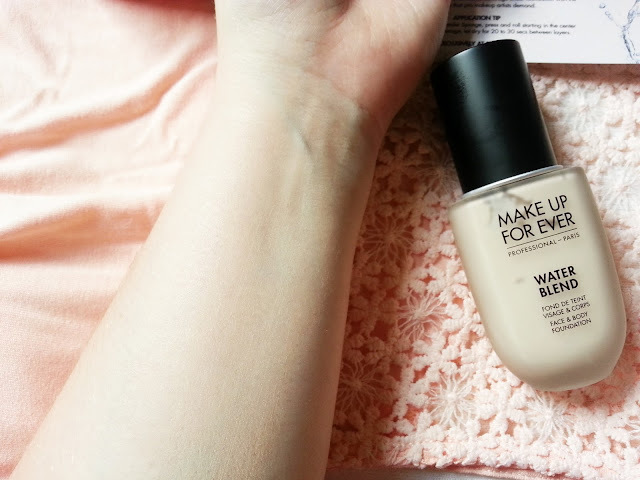 Overall, I really wanted to like this foundation. I thought a water based formula would be great for someone with dry skin, but I feel like this just misses the mark for me. It clings to dry patches, it applies unevenly, you can't build it up because it will just move around the previous application. There is very little coverage. It does last throughout the day, but it just looks the same as when you first apply. Which is great if it looks great on the skin to begin with, but I could never get it to where I would like it. If you're someone with normal skin, with no dryness or dehydration issues, and don't have much to cover up, then I could see this working for you. However anyone with any type of pigmentation, or skin issues - you probably won't like this! If I had to wear this again, I would probably choose to apply it with the Real Techniques Sponge, but I would be sure to exfoliate before hand, and possibly a hydrating primer (which I don't have at the moment).